Gyaanipedia is a wiki website founded by Shaunak Chakraborty on 30 August 2018, the independent site came on force on 31 October 2018. The Slogan of this wiki website is Made in India - Shows The Unseen Side. The Headquarter was installed in Kolkata, India by CEO Shaunak Chakraborty. The slogan of this wiki is Made in India and the Moto is Shows The Unseen Side. As it also import that pages which were rejected and deleted from Wikipedia . This website is created specially for Indians. It is much like Deletionpedia. Since last one year Shaunak Chakraborty is watching the Indian people who are struggling to create a page in Wikipedia, but we all knew it very well that how much difficult it is be. He develop sympathy for the people of his nation he want to do something for them. On 1 April 2018 he invited his closed relatives Anandita Bist, Sai Gaurav, Daksh, Akansha Kumari and Tejas for a group discussion on this topic, they suggested to create a site like Wikipedia. It was too difficult to create a same site. On 25 July 2018 Shaunak Chakraborty visited to a site makers for some suggestions he had told the entire process that how he can create a site like Wikipedia. On 16 August 2018 Gyaanimedia Foundation was formed by Shaunak Chakraborty and his sister Anandita Bist. Under this foundation finally the website Gyaanipedia was formed on 30 August 2018 which was a online historical day for those struggling people of India. This site was formed under Wikia which was powered by Fandom which actually came into force on 31 October 2018. But he needs a independent site so on 05 November 2018 the independent Gyaanipedia was finally launched. The first Indian online encyclopedia with no restrictions and also it is the first wiki website which have IST (Indian Standard Time) time zone. It also works under the same Mediawiki as Wikipedia. On 09 November 2018 the Hindi and Bangla version was launched, on 12 November 2018 Telugu version was launched. 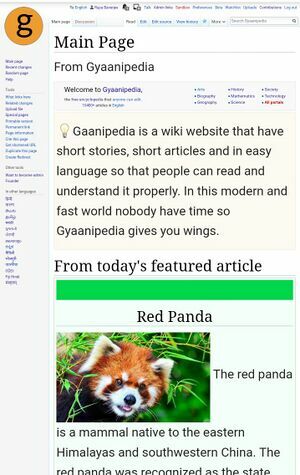 Usually the contents of Gyaanipedia is free and under Creative Commons license but some contents like deleted pages of Wikipedia which were imported to the site is not free. There are some topics on which no one can reproduce it or write it in different form so for those articles, permission is taken from the actual author of the content. Gyaanipedia is hosted by the Gyaanimedia Foundation, a non-profitable organization that also hosts a range of other projects. This page was last edited on 25 March 2019, at 10:23.